The Pinotage Club: Riedel to make Stormhoek Iced Pinotage glass ? Riedel to make Stormhoek Iced Pinotage glass ? The blogosphere has been full of posts about Stormhoek's new pink Pinotage that is designed to be served over ice. I got to taste it at the London International Wine trade show yesterday and again today. Yesterday they served it in the standard small ISO* glasses with a few ice cubes added. And I was not entranced. The London heatwave had defeated the show hall's air-conditioning, and the few cubes of ice that could be squeezed into the small ISO glass couldn't chill a warm wine. The impression I got was a simple sweet pink wine. I returned to the Stormhoek stand this morning and suggested that an ISO glass was not ideal and it would be better if the wine came from the fridge. 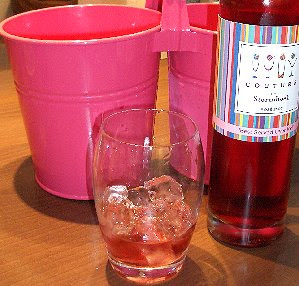 A nearby fridge was raided and a larger glass found (pictured above left) which was loaded with ice and topped with Couture Rose -- Stormhoek's new Pink Pinotage made to be served over ice. It has an inviting colour -- and chilling removes the overt sweetness I didn't like the previous day -- and the Pinotage variety has enough body to deliver satisfying flavour. "So why use ISO glasses?" I asked. "When we launch the wine to the public, we intend to have ready a special glass made just for this wine -- the ISO glass we use here at this trade show is the standard glass supplied for this show." I couldn't help but notice that almost opposite was the Riedel stand. Riedel are famous for creating glasses designed to get the best from almost any wine that you can name. I put the question. "Are you working with Riedel to produce a glass for iced Couture Rose?" My answer was a smile and a discreet 'No comment'. WINE to revive Pinotage Champion Competition? What did I learn working at LIWSF?